The Doctor is feeling confident: this time the TARDIS has landed on Earth; in England; in 1963. But when he and his companions venture outside, they are soon lost in a maze of ravines, and menaced by gigantic insects. Yet the insects are dying – every living thing is dying… Meanwhile, in a cottage garden on a perfect summer’s day, a man from the Ministry arrives to put a stop to the production of DN6, a pesticide with the power to destroy all life-forms. But the men who invented DN6 will stop at nothing – not even murder – in their desire to see DN6 succeed. Can the one-inch-tall Doctor, along with granddaughter Susan and schoolteachers Ian and Barbara, foil their plans…? This is an unabridged reading of Terrance Dicks’s novelisation of the 1964 serial by Louis Marks. Planet of Giants was one of the first story ideas ever devised for the television show, and might even have gone out as the opening serial (by a different writer, C E Webber) had things panned out differently. And yet (as I have learned from David J Howe’s CD liner notes) it was the last William Hartnell serial to be novelised, as successive editors considered it the least engaging of the First Doctor’s adventures. 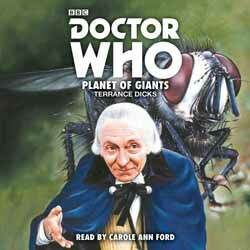 I found this revelation surprising, as in my view Planet of Giants is one of the most intriguing Hartnell stories. So sluggish is the plot of Planet of Giants that the original serial was hacked down from four episodes to three, with the final two episodes edited into one. Dicks doesn’t include much of the excised material from the four-part version, which is a bit of a shame, though given the pace of the plot, I can understand his decision. I find the transmitted version of the third episode a little too hasty and lacking in explanations, while the full versions of the final two episodes (which were reconstructed as a DVD special feature) are too long-winded and padded out. The ideal pace lies somewhere in between, so on balance I think the novelist gets this aspect right. The result has the dubious distinction of being the shortest Doctor Who novelisation, with the audio book running to just 2 hours and 35 minutes. Even the two-part serials (adapted by other writers, such as Ian Marter and Terence Dudley) ended up longer than this. Carole Ann Ford, who played Susan in the television series, is good at re-creating not only Susan’s voice but also that of her fellow traveller Barbara. She succeeds in conveying the latter’s increasing infirmity and desperation as she succumbs to the effects of DN6, which helps to offset the implausibility of Barbara not telling her companions that she has been infected (Dicks explains that she doesn’t want to worry Ian). Both Dicks and Ford have fun with the character of telephone exchange operator Hilda, who puts on a posh, sing-song voice whenever she speaks into the phone. Ford is also surprisingly good as the sinister, nasal villain Forester, and thankfully the government scientist Farrow doesn’t whistle his sibilants as he does on screen. One confusing aspect of the reading, however, is that Ford rarely allows a pause when the narrative shifts to a different scene. Sadly, despite Ford’s efforts, what had been among my favourite Hartnell stories is one of the weaker novelisations, a minuscule among giants.